Bruxism is apparent when excessive teeth grinding occurs, usually whilst asleep. Although, the causes of bruxism are not always clear, and as such, there could be many reasons why this is occurring. There are a variety of sleep bruxism treatment options to consider. At 23MD, this is our recommended treatment option, as research has shown that Botox® is just as effective – if not more – as other more established methods. Botulinum toxin has been established as a well-proven treatment for reducing extensive muscle activity, which temporarily eliminates the action of teeth grinding and can also significantly prevents headaches. Botox® is safely administered via an injection into the masseter muscle (the large jaw muscle that enables movement), which weakens the muscle in order to reduce the bruxism process for around 3 to 6 months. Although there have been many other treatment proposals over the years to decrease the level of bruxism, the only proven treatments for bruxism are mandibular advancement devices, hypnosis and occlusal splints. These are small plastic mouth-guards that can be used immediately without specialist fitting. MADS are generally used for the management of snoring and sleep apnoea but researchers have also investigated their use for the management of sleep bruxism. 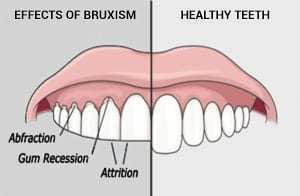 Psychoanalysis, autosuggestion, hypnosis, progressive relaxation, meditation, self-monitoring, sleep hygiene and habit reversal/habit retaining have all been prescribed for the management of bruxism. Physical rehabilitation techniques have been thought to assist in correcting bruxism. The objective of developing or strengthening the jaw opening muscles is to ‘hold the mandible in balance’. The use of medication in the management of bruxism has been studied, although has relied solely on patients’ reports. Experts have discussed how a healthy and organised sleep routine can avoid actions such as bruxism, whilst also promoting a better night’s sleep. In order to encourage a healthy sleep routine, you should try to avoid stimulants such as caffeine and tobacco at least several hours before going to sleep. Biofeedback is a technique that involves attaching electrodes to a patient’s skin to monitor reactions in order to reduce stress. Biofeedback therapists believe that those who suffer from bruxism can benefit from this technique, as through this process they can ‘unlearn’ their habit by using a stimulus to make them aware when grinding their teeth. For further information on our premier Botox® bruxism treatment, book a consultation today by calling us on 020 707 80203 to find out if this is the right treatment for you.